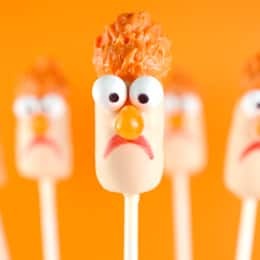 Enter Muppet Labs and whip up a batch of Beaker cake pops! Note: One cake makes about 48 cake pops. If you don't need that many, then cut the cake in quarters and freeze any cake sections for another day. You'll need at least one ounce of candy coating for each Beaker cake pop you plan on dipping and decorating. 5. When they are firm, shape the cake balls into cylinders. Return the cake pops to the refrigerator to maintain firmness. 6. Melt equal parts peach and white candy coating in a heat-proof plastic bowl so that the coating is at least three to four inches deep for easier dipping. Melt in the microwave in 30 second intervals on low, stirring in between. Repeat until melted and smooth. 7. Remove a couple of cylinder-shaped cake balls from the refrigerator at a time to work with. 8. Dip the tip of a lollipop stick into the melted coating and insert into the bottom of Beaker's head. Dip and remove the cake pop in one motion without stirring. Make sure the entire shaped cake ball is covered. Using a deep bowl is helpful here. If your coating is too thick, you can add a little vegetable oil or shortening to help thin it and make it easier to work with. 9. Remove and allow any excess coating to fall off the pop and back into the bowl. 10. Before the coating sets, attach one orange jelly bean in position for the nose and two white sixlets in position for the eyes. Repeat with remaining pops. 11. Place in a styrofoam block to dry. 12. Dip a chocolate candy in melted orange candy coating and place on top of Beaker's head. Then let dry and repeat with remaining pops. 13. When dry, dip the top, uncoated part of the Hershey's Kiss in the orange coating so that the Kiss is completely covered. As the coating in the bowl starts to cool and thicken, apply more coating using a toothpick and texturize to resemble Beaker's wild hair. 14. Use a black edible ink pen to draw on the eyes and a red edible ink pen to draw his mouth. 16. You can wrap in treat bags tied with a ribbon and/or store them on the counter or in an airtight container for several days.